The 2019 Mayoral Prayer Breakfast Guest Speaker is Mr. Al Lindner. During a long career spanning the most revolutionary years in sportfishing history, Al Lindner ranks among the most renowned leaders in the fishing industry. He continues to fish avidly for all freshwater fish, averaging about 180 days a year on the water, and is hailed as one of the world’s best all-around anglers. As the host of Lindner’s Angling Edge and Fishing Edge television series, Al remains immensely popular as one of the best-recognized angling authorities in North America. Al, however, has always worn many hats, and even his most avid fans may not realize the extent of his past and present involvement with all aspects of the fishing business. Other than finding new and better ways to catch fish, that is. Foremost among his current efforts, Al is a driving force at Lindner Media Productions, which specializes in producing educational fishing programs and DVDs, national TV commercials, product sales presentations, point-of-purchase product DVDs shown internationally in sporting goods stores and provide their trademark underwater photography to the sport fishing industry. He was co-founder of the In-Fisherman Communications Network, Lindner Media Productions and the Lindy Tackle Company. 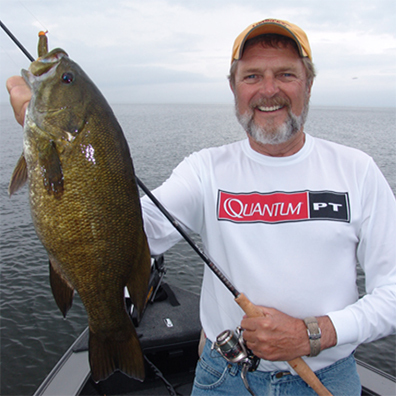 He is currently the host of Lindner’s Angling/Fishing Edge, and into his 4th consecutive decade on television. His continuing dedication to teaching youth to fish reached a high point when the U.S. Fish and Wildlife Service used his In-FisherKIDS Camp Fish formula as a nationwide teaching tool. Of all his titles, however, Al prefers that of “Angling Educator,” a lifelong obsession he tirelessly pursues.